Background and objectives: The mortality risk associated with attempting to raise hemoglobin (Hb) levels by increasing Epoetin alfa (EPO) doses in hemodialysis patients with persistently low Hb remains poorly understood. Design, setting, participants, & measurements. We included hemodialysis patients from a large dialysis provider between July 2000 and June 2001 who had EPO dose and Hb data for 6 consecutive months, and a mean Hb <11 g/dl in months 4 to 6 (sub-11 period). We identify predictors of EPO dose changes during the sub-11 period; evaluate the proportion of patients achieving a Hb ≥11 g/dl after the sub-11 period by dose-change categories; and evaluate the association between EPO dose changes and mortality risk. Results: Patients were more likely to receive greater EPO dose increases if they had lower EPO doses, higher Hb levels, or were recently hospitalized. Greater EPO dose increases elevated the likelihood of achieving an Hb ≥11 g/dl in the subsequent 3 mo. Larger EPO dose changes over the sub-11 period were not associated with an elevated mortality risk, but having an Hb <9 g/dl at the end of that period independent of dose change was associated with mortality risk. We found that patients receiving larger dose changes and whose resulting Hb level remained <9.5 g/dl at the end of the 3 mo were at elevated mortality risk. Conclusions: In patients with persistently low Hb levels, mortality risk was strongly associated with the patient's ability to achieve a hematopoietic response rather than the magnitude of EPO dose titrations. Numerous observational studies in hemodialysis (HD) patients have shown that higher achieved hemoglobin (Hb) levels are associated with lower mortality risk (1–3). These data, however, are inconsistent with evidence from randomized clinical trials showing that targeting patients to higher Hb levels is associated with greater mortality risk (4–6), although patients who achieved higher Hb levels in these studies had better clinical outcomes. This paradox—that patients who can achieve higher Hb levels experience better clinical outcomes but targeting patients to higher Hb levels is problematic—may highlight the importance of responsiveness to care, which was recently shown to be an important prognostic indicator in a reanalysis of data from the Normal Hematocrit Cardiac Trial (NHCT) (7). More recently, large observational studies using U.S. Renal Data System (USRDS) data have shown that the longer a patient's Hb values remain below 11 g/dl, the greater the risk of death (8,9). Gilbertson et al. 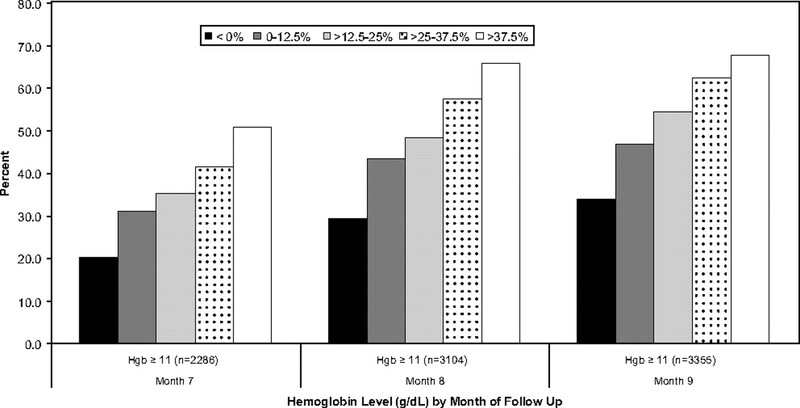 (8), using USRDS data, found that patients whose Hb values remained persistently below 11 g/dl over a 6-mo period had a 2.18-fold [95% confidence interval (CI): 1.95, 2.43] increased risk of death compared with patients whose Hb was consistently between 11 and 12.5 g/dl. Both of these studies suggest that the inability to raise Hb levels in response to Epoetin alfa (EPO) therapy is an important mortality predictor. Although EPO dosing was not explicitly evaluated in either of these studies, a previous study using USRDS data found that patients with persistently low Hb levels are likely to receive consecutive EPO dose increases, and among these patients, nearly 90% were able to achieve a hematopoietic response (10). Taken together, these data raise important clinical questions pertaining to the treatment of patients with persistently low Hb values: for whom can EPO doses be safely increased in an attempt to achieve higher Hb values, and for whom might such dose increases be contraindicated? To begin to address these questions, we evaluated mortality risk associated with EPO dose increases among patients whose Hb values remained <11 g/dl over 3 consecutive months. We used data from Fresenius Medical Care–North America (FMC-NA), a large dialysis organization that provides HD to >100,000 patients in the United States and routinely collects patient information as part of standard clinical practice. These data, which have been described previously (11), include information on demographic characteristics, laboratory parameters, medication use, dialysis care, and clinical outcomes including hospitalization events and death. We had access to a sample of over 60,000 HD patients aged 18 yr or older who had no history of peritoneal dialysis and who were receiving routine outpatient dialysis in the FMC-NA network between July 2000 and June 2002. All data captured in the database (aside from hospitalization data) reflect outpatient dialysis care administered in the dialysis facility. We identified the subpopulation of FMC-NA patients (n = 6133) who met the following criteria: (1) at least 6 consecutive months with nonmissing EPO dose and monthly Hb data between July 2000 and June 2001, and (2) a mean Hb level <11 g/dl in each of months 4, 5, and 6 of this 6-mo period. The last day of the 6-mo period was defined as the index date. All patients were further required to survive for at least 1 d after the index date. We refer to months 1 to 3 as the “entry period” and months 4 to 6 as the “sub-11” period. The follow-up period began immediately after the sub-11 period and continued for 6 mo (months 7 to 12) (Figure 1). Study design and specific time intervals for data evaluation. We calculated the average per administration EPO dose for each month of the entry and sub-11 periods. We defined the baseline EPO dose as the month-3 average per administration dose (last month of the entry period and the month immediately preceding the sub-11 period). We then calculated the average month-to-month change in EPO dose during the sub-11 period as follows. In each month, we estimated the dose change for each individual by fitting a regression line of EPO dose versus day using all administrations during the month (average daily change in EPO dose) and then multiplied this by 30.4 (average number of days in a month) to estimate the average monthly EPO dose change. This was then divided by the first dose administration in the first month of the sub-11 period to arrive at the percentage change. For each subject, we then calculated the geometric mean of the monthly percent dose change (i.e., the average percent change per month) and grouped them as: <0%, 0 to 12.5%, >12.5 to 25%, >25% to 37.5%, and >37.5%). We used a geometric rather than arithmetic mean to describe the dose changes because it is a more appropriate measure of the average percent change (12). These dose-change categories were selected to coincide with the Epogen package insert, which recommends dose increases up to 25% per month when attempting to increase Hb levels to the desired target range (13). The two primary outcomes of interest were: (1) proportion of subjects achieving Hb values ≥11 g/dl in the 3 mo after the sub-11 period (months 7 to 9); and (2) death within the 6 mo after the sub-11 period. For the mortality analyses, patients were followed from the end of the sub-11 period to the first occurrence of: death, loss-to-follow-up for reasons including withdrawal, transplant, or transfer to another facility; or 180 d of follow-up. We assessed patient characteristics including demographics, dialysis care, laboratory values, concomitant injectable medication use, and hospitalization events during the 6 months preceding the index date. Demographic characteristics including age (in years), gender, race (black, white, other), body mass index (kg/m2), diabetes as the primary cause of ESRD, and length of time on dialysis (in months) were assessed as of the index date. Laboratory parameters were assessed separately during the entry and sub-11 periods. We evaluated serum albumin (g/dl), serum ferritin (pg/ml), and transferrin saturation percentage as the mean value during each period. Hb levels (g/dl) were characterized three different ways depending upon the analysis: (1) mean Hb in month 3; (2) mean Hb during month 6 (<9.0, 9.0 to <9.5, 9.5 to <10.0, 10.0 to <10.5, and 10.5 to <11 g/dl); and (3) mean Hb during months 7, 8, and 9 (≥11 versus <11 g/dl). Dialysis care information included the urea reduction ratio and vascular access type. Urea reduction ratio was assessed as the mean value during the entry and sub-11 periods. Because the vascular access type in use (arteriovenous fistula, arteriovenous graft, and catheter) can change within a month, the last observation in each month was assigned as the monthly value. Concomitant iron administration was evaluated as the average dose (mg) during the entry and sub-11 periods. Other covariates evaluated included predialysis systolic and diastolic blood pressure (mmHg). We identified all hospitalization events occurring during the 6 mo preceding the index date and patients were classified based on the number of hospitalization events (0, 1 to 2, and ≥3) during the entry and sub-11 periods. We used descriptive statistics to compare patients across EPO dose-change categories and then conducted the following three sets of analyses. First, we used ordinary least-squares regression to predict the mean percentage dose change (as a continuous variable) in the sub-11 period as a function of patient characteristics (robust standard errors were used to account for nonconstant variance (14)). Measures for blood pressure, iron dose, dialysis adequacy, and all other laboratory values were assessed based on their average values during the entry period; vascular access type was that in use at the end of month 3. Second, we used Kaplan–Meier plots and log-rank statistics to compare the cumulative probability of achieving Hb levels ≥11 g/dl in each of the 3 mo after the index date across dose-change categories. Third, we used Cox proportional hazard regression to obtain hazard ratio (HR) estimates and 95% CIs for the association between dose-change categories and risk of death during the follow-up period (months 7 to 12), controlling for potential confounding variables. EPO dose changes of 0 to 12.5 were used as the reference category. In these models, we also assessed whether the effect of EPO dose change on subsequent mortality risk varied by the achieved Hb level in month 6 (Hb level resulting from the dose change). For modeling this interaction term, Hb was dichotomized as <9.5 versus ≥9.5 g/dl, and dose change was dichotomized as ≤12.5 versus >12.5%. Covariates in these analyses were based on measurements obtained during the sub-11 period; vascular access type was that in use at the end of month 6. We observed that the mean baseline (i.e., month 3) per administration EPO dose was inversely correlated with mean dose change during the sub-11 period (i.e., subjects receiving the highest maintenance EPO doses entering the sub-11 period received smaller dose titrations during the sub-11 period). We therefore conducted an additional analysis limited to those patients receiving maintenance EPO doses in the upper tertile of the dose distribution (>7800 units per administration). This subanalysis specifically focused on assessment of mortality risks associated with greater dose changes among patients who were already receiving the highest EPO doses. Because these patients generally had smaller EPO dose changes during the sub-11 period, we recategorized mean dose change approximately into quintiles (<0%, 0%, >0 to 8.7%, >8.7 to 18.9%, and >18.9%). Finally, to investigate the association between mortality and Hb response to EPO dose changes during the sub-11 period, we categorized patients according to whether they achieved a Hb ≥11 g/dl in month 7 (the month immediately after the sub-11 period). We then used Cox proportional hazards regression to compare the mortality HR over the subsequent 5 mo for those who did versus did not achieve an Hb ≥11 in month 7. Adjustment for confounding was as described above. Analyses were conducted using SAS version 9.1.3 and Stata version 9. The mean age of the 6133 patients included in the analysis population was 59.3 yr; 52% were women, 48% were black, and the mean body mass index was 27.5 kg/m2 (Table 1). Mean (SD) Hb was 11.4 g/dl (1.2) during the entry period (the 3 mo before the sub-11 period) and 10.0 g/dl (0.6) during the sub-11 period. The mean (median) percent dose change over the sub-11 period was 28% (19.6%), with 12.2%, 23.3%, 24.3%, 16.0%, and 24.2% of patients having average monthly dose changes of <0%, 0 to 12.5%, >12.5 to 25.0%, >25.0 to 37.5%, and >37.5%, respectively. Patients were generally comparable across EPO dose-change categories with respect to baseline demographic, laboratory, and medical history characteristics (Table 1). In bivariate analyses, patients with higher Hb values or receiving smaller maintenance EPO doses in the month preceding the sub-11 period were more likely to receive larger EPO dose changes during the sub-11 period (Figure 2). In multiple variable regression models in which all potential covariates were assessed, only three factors were predictive of future dose changes: the maintenance EPO dose, Hb level during the month preceding the sub-11 period, and having a recent hospitalization. The percentage dose changes were greatest for patients receiving maintenance EPO doses <3400 units per administration (20%, 95% CI: 17.8 to 22.5%), for patients with previous Hb values >12 g/dl (7.9%, 95% CI: 5.7 to 10.1%), and for patients with one or more hospitalizations in the past 3 mo (1.8%, 95% CI: 0.0 to 3.5%; data not shown). Mean monthly percentage change in Epoetin alfa (EPO) dose during the sub-11 period (months 4 to 6) by the mean per administration EPO dose (units) in month 3 (last month of the entry period) and the mean achieved hemoglobin (Hb) level (g/dl) during the entry period (months 1 to 3). Larger EPO dose increases during the sub-11 period were associated with greater probability of achieving Hb concentrations ≥11 g/dl in each of the 3 mo (months 7 to 9) after the sub-11 period (P < 0.0001; Figure 3). In particular, by 3 mo after the sub-11 period (month 9), 34% of patients who did not receive a dose increase (dose change <0%) had achieved an Hb level ≥11 g/dl compared with 68% of patients who had received the highest dose increases (>37.5%). Analyses examining the association between magnitude of EPO dose change during the sub-11 period and risk of mortality during the subsequent 6 mo were limited to 5974 patients with complete covariate data. Compared with patients who received a mean dose increase of up to 12.5% per month, patients receiving no change in dose or a downward dose titration had an adjusted mortality HR of 1.09 (95% CI: 0.85 to 1.39), and those receiving dose increases of >37.5% had an adjusted mortality HR of 0.86 (95% CI: 0.69 to 1.08; Table 2). However, there was a strong, inverse association between achieved Hb at the end of the sub-11 period (month 6) and subsequent mortality risk. Compared with patients with Hb concentrations between 10.5 and 11 g/dl, those with achieved Hb values <9 g/dl had an adjusted mortality HR of 1.9 (95% CI: 1.50 to 2.40; Table 2). Additional patient factors that were independently associated with mortality hazard included older age, black versus white race, higher albumin levels, catheter vascular access versus arteriovenous fistula, and recent hospitalization. When we limited the analysis to patients in the highest tertile of maintenance dose preceding the sub-11 period, those receiving the highest dose increases within this group (>18.9%) had a mortality HR of 0.86 (95% CI: 0.61, 1.20). As in the overall analysis, lower achieved Hb values were strongly associated with greater mortality risk (Figure 4). Hazard ratio (HR) and 95% confidence interval (CI) estimates for the associations between: (1) the mean monthly percentage change in EPO dose during the sub-11 period (months 4 to 6) and the risk of death over the follow-up period (left panel); and (2) the month-6 achieved Hb level and the risk of death over the follow-up (right panel). This analysis was limited to patients who were receiving the highest maintenance EPO doses (upper tertile) in the last month of the entry period (month 3). Estimates were adjusted for age, race, gender, body mass index, diabetes, vascular access type, albumin, ferritin, transferrin saturation, systolic and diastolic blood pressure, missed EPO administrations, iron dose, and hospitalizations. We further investigated whether the effect of EPO dose change on subsequent mortality risk varied by Hb level in month 6 (after the dose changes). 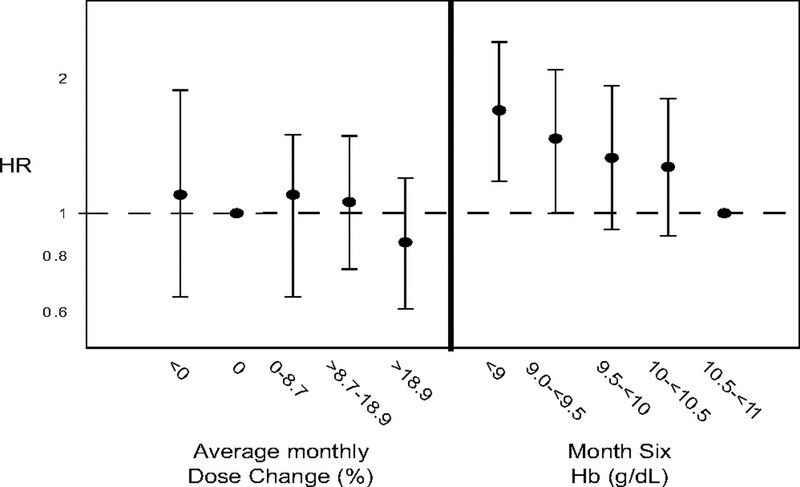 Although there was no apparent association between magnitude of dose change during the sub-11 period and subsequent mortality overall, we did find that patients receiving larger dose increases (>12.5 versus ≤12.5%) over the sub-11 period and whose resulting Hb level remained <9.5 g/dl at the end of the 3 months were at elevated risk of mortality (HR = 1.32, P value for interaction = 0.02). Finally, for patients who survived to or were not censored before month 7 (the first month after the sub-11 period; n = 5794), we evaluated the association between the achieved Hb in month 7 and the risk of death in the subsequent 5 months. After adjustment for confounding and previous dose changes, patients who achieved Hb values ≥11 g/dl (compared with Hb <11 g/dl) had a lower mortality risk (HR = 0.79, 95% CI: 0.65 to 0.96). Among HD patients with low Hb values, EPO doses are often increased in an attempt to raise Hb concentrations. In this study of over 6000 U.S. HD patients with Hb levels persistently <11 g/dl over a 3-mo period (hyporesponsive patients), lower achieved Hb levels at the end of the 3-mo period rather than greater EPO dose changes during the period were most strongly associated with subsequent mortality risk. This finding persisted even among patients receiving the highest maintenance doses before the period of hyporesponse, and thus the highest doses at the end of the sub-11 period. Although we did not observe an association between magnitude of dose change during the sub-11 period and subsequent mortality overall, we did find that patients whose Hb levels remained low during the sub-11 period were at increased mortality risk, suggesting that a patient's inability to mount a Hb response in the presence of greater EPO dose challenges is an important prognostic indicator. Lastly, we observed that physicians make smaller EPO dose titrations in patients already receiving larger maintenance EPO doses and who have demonstrated previously poor hematopoietic response to therapy. Accumulating evidence suggests that persistently low Hb levels are strongly associated with increased mortality risk (8,9,15). However, none of these studies evaluated the mortality risk specifically related to increasing EPO doses. A very real concern in anemia management of HD patients has been that increasing EPO doses in patients with considerable disease burden and poor hematopoietic response (i.e., persistently low Hb levels despite increasing doses) confers an increased mortality risk. Although our analysis does not suggest an elevated mortality risk independently associated with greater EPO dose titrations among patients with Hb levels <11 g/dl over a 3-mo period, our findings do suggest that, in addition to other traditional mortality risk factors (e.g., older age and lower albumin levels), poor response to therapy is an important prognostic indicator. This is consistent with a recent analysis by Kilpatrick et al. (7) using data from the NHCT (4), which found that lower Hb response after a uniform EPO dose increase was strongly associated with greater mortality risk. Recent large randomized clinical trials in patients with chronic kidney disease have shown that targeting higher Hb levels increases the risk of mortality and cardiovascular hospitalizations (4–6). In the NHCT (4), HD patients randomized to a target Hb level of 14 g/dl (who as a result also received higher EPO doses) had a 1.3-fold (95% CI: 0.9 to 1.9) increased risk of the composite endpoint of mortality or nonfatal myocardial infarction. Paradoxically however, patients who achieved higher hematocrit levels had a lower risk of the composite endpoint (4). Similar findings were observed among chronic kidney disease patients not on dialysis in the Correction of Hemoglobin in Patients with Chronic Kidney Disease (CHOIR) study (5), where targeting higher Hb levels was also associated with increased mortality and cardiovascular hospitalization risk. Again, patients who were able to achieve higher Hb levels had a lower risk of the composite endpoint. Although both studies raised concerns pertaining to potential risks associated with EPO dosing, it is important to note that dose titration in these studies was protocolized to drive patients to higher Hb targets regardless of the clinically indicated dose. In the study presented here, patients receiving higher baseline EPO doses generally received smaller dose titrations in response to persistently low Hb levels. These data suggest that in general clinical practice physicians consider the patient's underlying condition as well as previous EPO dosing and Hb history when making future dosing decisions. Recently, two observational studies using USRDS data found that patients with greater EPO dose requirements (i.e., doses needed to achieve a given Hb level) had an elevated risk of mortality over 1 yr of follow-up (16,17). More recently, an analysis using dialysis provider data replicated the findings in these studies, but then showed that improved adjustment for confounding and adjusting for changes in Hb levels and EPO doses over time (which indirectly accounts for patient responsiveness and more closely reflects the dynamic dosing paradigm involved in anemia management) resulted in a markedly attenuated mortality risk specifically related to EPO dosing (18). These findings provide evidence for the notion that the patient's underlying clinical status, which is an important prognostic indicator and is closely tied to a patient's EPO dose requirements to achieve a target Hb level, may be the critical factor contributing to mortality risk. However, this study did not specifically evaluate the effect of EPO dosing and EPO dose changes on subsequent mortality risk among the subpopulation of patients with persistently low Hb concentrations; that is, those patients who are likely to receive the greatest EPO doses (10) and who have been shown to have the greatest mortality risk (8,9). For these reasons, we sought to specifically investigate this subpopulation. The findings from the analyses presented here suggest that poor Hb response rather than larger EPO dose increases is most strongly associated with higher mortality risk, even among the subset of patients already receiving high doses. The important role of Hb response was further supported by our finding of a significant interaction between Hb level at month 6 and EPO dose change on mortality risk. Although there was no association between magnitude of dose change during the sub-11 period and mortality overall, the subset of patients who received greater EPO dose changes and who exhibited little Hb response (remained <9.5 g/dl) had a 32% increased mortality risk. In the context of a retrospective cohort study design, it is not possible to determine whether the higher mortality risk in the subset of patients who fail to respond to higher dose increases is related to the higher dose changes or to the patient's inability to mount a hematopoietic response. It is important to note, however, the differences in EPO dosing practices used in clinical practice, in which previous EPO dosing and Hb history are considered, from the strict dosing practices protocolized in previous clinical trials, in which patients were titrated to a single target regardless of their history. Our results should be evaluated in light of the following limitations. First, the difficulty of obtaining a valid estimate of the association between mortality and ESA dose or dosing practices on the basis of dialysis clinical practice data must be emphasized. Accurately characterizing such an estimate is complicated by patient comorbid conditions, frequent cardiovascular and infectious hospitalizations, and concomitant medication use, all of which have been associated with increased mortality risk and greater EPO dose requirements in the HD patient population (19–27). Furthermore, physicians actively act to mitigate patient risk. Thus, it is difficult to distinguish the extent to which an observed association between mortality risk and EPO dose or dose titration can be attributed to the dose versus patient characteristics that are considered by the physician when making patient treatment decisions. Second, we limited our study to patients with 3 consecutive months with Hb <11 g/dl, which precluded any evaluation of the acute or immediate effects of EPO dose changes on mortality risk within the 3-mo period. In addition, by requiring that patients survive for 3 mo, we may have selected a slightly healthier subpopulation of potential hyporesponsive patients. Finally, cause-specific hospitalization information including medical procedures was not reliably collected across FMC-NA facilities. Thus, we were unable to identify patients with pre-existing cardiovascular disease or examine the risk of cardiovascular-related hospitalizations for patients receiving greater EPO dose changes. Among HD patients with low Hb values, EPO doses are often increased in an attempt to raise Hb concentrations, although in clinical practice it appears that physicians do not increase EPO doses aggressively in patients already receiving high doses. It appears that poor Hb response to EPO therapy, rather than the magnitude of the EPO dose titration, is most strongly associated with an increased mortality risk, but only a clinical trial designed to specifically evaluate the effect of different EPO dosing strategies among potentially hyporesponsive patients can fully address this question. This study was funded by Amgen, Inc. Drs. Bradbury and Critchlow work in the Department of Biostatistics and Epidemiology at Amgen, Inc. Drs. Danese and Gleeson are employees of Outcomes Insights, Inc. and have received a research grant from Amgen, Inc. with no restrictions on publication.